FILE - Customers walk past an Apple logo inside of an Apple store at Grand Central Station in New York, Aug. 1, 2018. Apple's shares dropped 10 percent Thursday on the news — its worst loss since 2013. The company shed $74.6 billion in market value, amid a broader sell-off among technology companies, which suffered their worst loss in seven years. 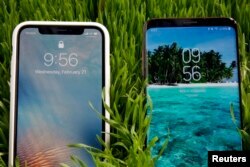 FILE - An Apple iPhone X, left, and a Samsung Galaxy S9 Plus mobile phone are displayed during a preview in New York, Feb. 21, 2018. 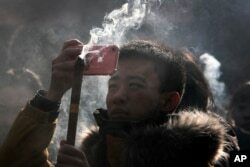 FILE - A Chinese man uses iPhone to take picture as he prays for health and fortune on the first day of the New Year at Yonghegong Lama Temple in Beijing, Jan. 1, 2019.